Akamai has come out with their quarterly report on the State of Internet based on the traffic they received on their network. India’s average Internet speed grew at modest 21 percent year on year and 20 percent quarter on quarter to 1.3 Mbps. India’s speed still remains one of the lowest in the world. Even in Asia Pacific region, most of the countries have much higher internet speeds than India. India’s average internet speeds are less than half of global average which is 3.1 Mbps. Countries like Thailand and Malaysia have twice or thrice the speeds India has. Even when it comes to average peak Internet speed, India is one of the lowest in the world with only 8.3 mbps. Comparatively, China has a peak speed to 13.9 Mbps, Thailand has 30.1 Mbps, while South Korea has fastest peak internet speed of 63.6 Mbps. As per Akamai report, India has unique 16.28 million unique IP addresses, out of which only 2.4 percent of users have internet speeds of over 4 Mbps. Among other Asia Pacific countries, the same number for China is 5.3 percent, For Japan it is 79 percent and for South Korea it is 87 percent. The silver lining for India though is that higher broadband connections are growing at a healthy pace. There were 66 percent more users who had >4 Mbps connections as compared to last year. 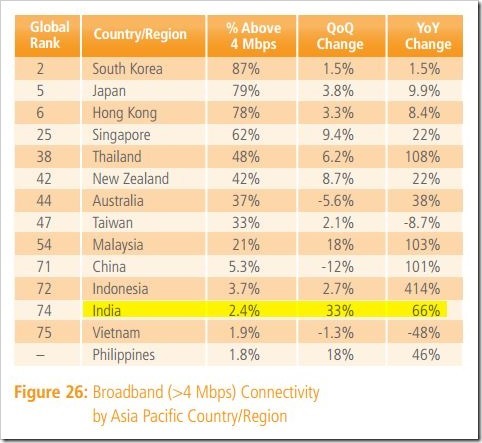 Akaimai’s report also states that only 0.3 percent of Indian internet connections are over 10 mbps, which is better than China (0.2) and they are also growing at decent rate of 85 percent. Asia Pacific remained the top region for attack traffic with 68 percent originating from there. China remained the top source of observed attack traffic on Akamai network with 34 percent, followed by Indonesia which accounted for 21 percent. India’s attack traffic grew 3 percentage point from previous quarter to 2.6 percent. 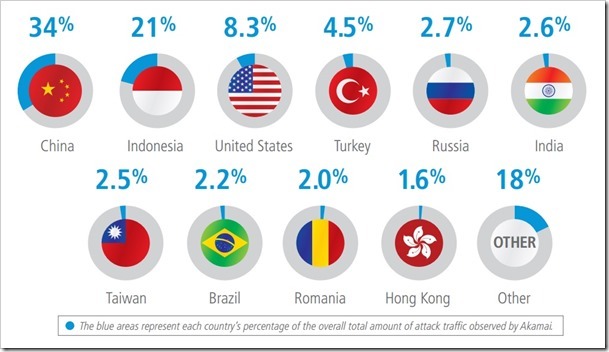 India and Hong Kong and Indonesia were the 3 countries in top 10 which saw increase in attack traffic. Indonesia saw a sharp rise of 30X as compared to previous quarter (From 0.7% to 21%). Interestingly, Akamai’s report did not cover India’s mobile internet speed, which in our opinion may show a completely different picture now, especially due to the fact that 3G is now catching up with users with the data rates coming down drastically over past few months. India is definitely lacking in this technical world just because of unavailability of internet. Many people want to start their online career but the biggest obstacle we have is internet. When I started blogging then I used 2G SIM and that was the worst time (even I built my blog with 2G SIM only). I always missed good internet speed and wanted to have little more speed. Once we will have good internet speed in India then as per my thinking we will start growing.